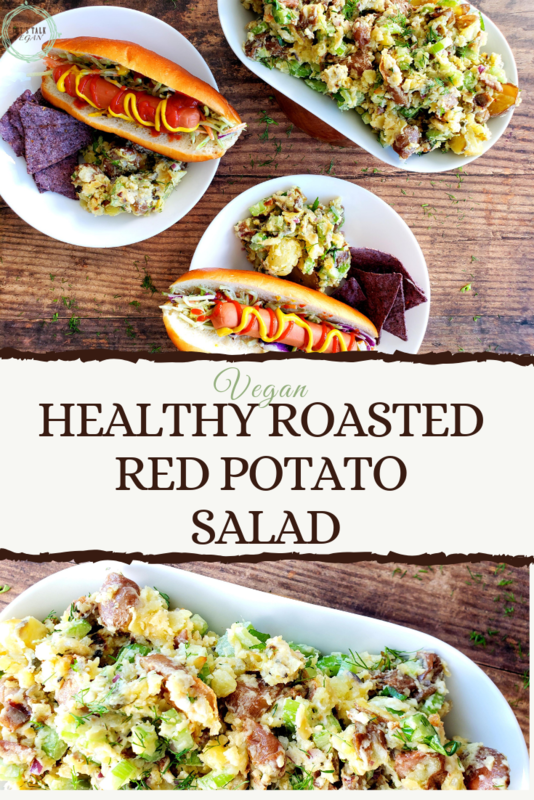 Take your vegan bbq to the next level with this Roasted Red Potato Salad. This classic recipe is made with fresh dill, creamy mayo, & other delicious spices. With summer just around the corner, I have BBQs on the mind. 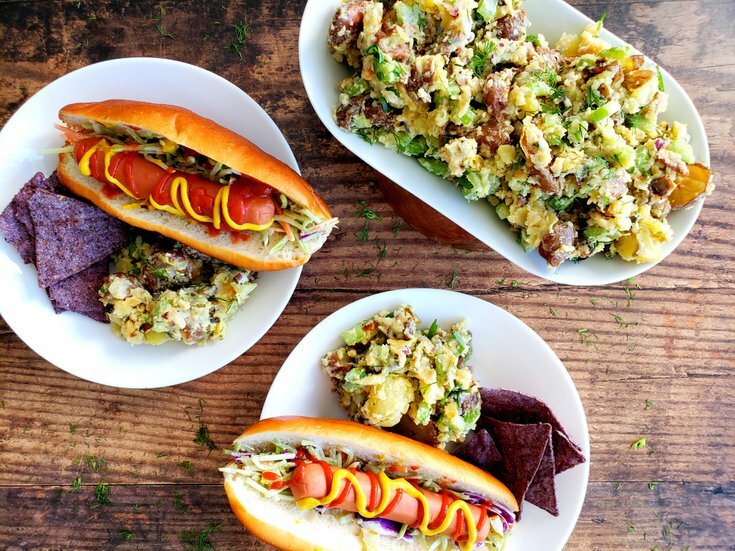 What goes better with a vegan BBQ than a big side of potato salad? Arguably nothing, well at least not until I have eaten enough potato salad to last me the season. When making potato salad you want to pick a waxy potato. This is because the waxier a potato is the least amount of starch it has. Plus, the potato will be able to hold its shape better when boiled. Since we aren't boiling the potatoes, this doesn't really matter, but just something to keep in mind. Based on your preference, you can leave the skin on or off. Since the skin holds a lot of the nutrients I leave it on. 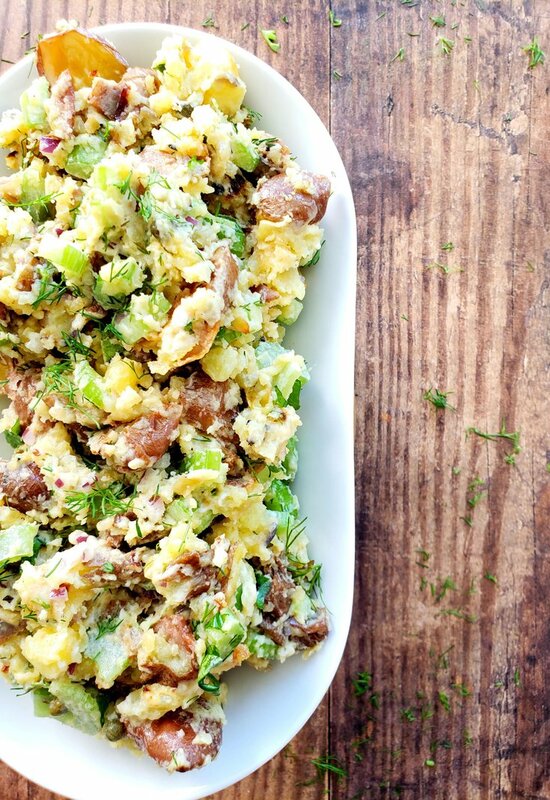 It also gives the potato salad more color and texture. Once you've decided to peel or not to peel your potatoes, slice them in half. Then, toss them with the olive oil, chopped red onion, a pinch of salt, a pinch of pepper, and minced garlic. Make sure to leave a tablespoon of minced red onion to mix in with the cold veggies. Note: It's important to spice the potatoes while they are cooking so that they can absorb the garlic and onion flavours. This holds true if you are boiling the potatoes as well. Even just a little salt and pepper can go a long way. 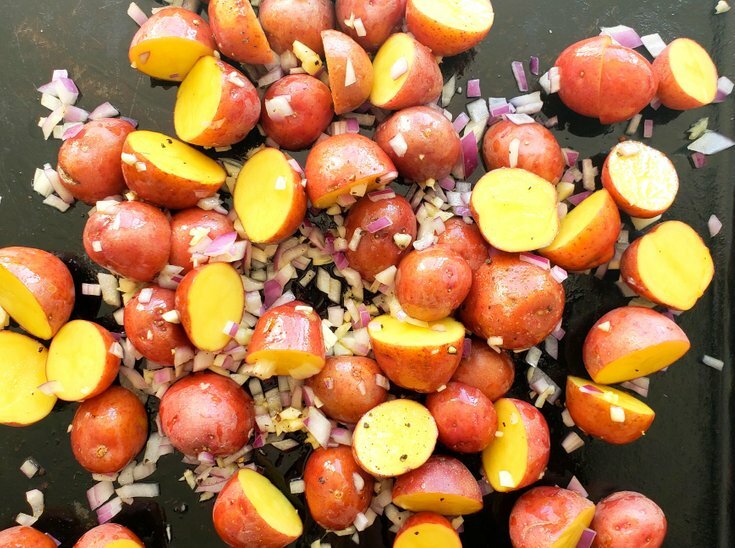 Next, dump the potatoes onto a baking sheet, and cook for 20-30 or until a knife can easily be inserted into the side. They should have a slightly crispy outside and tender inside. Once cooked, use a fork to mash some of the potatoes (you want some texture, so don't completely mash every one). Set aside cool. Time to start the salad part. 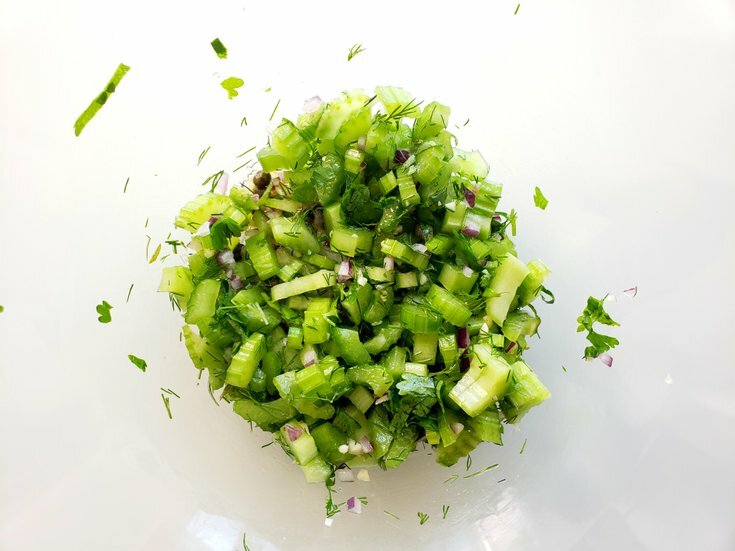 In a large bowl, add the minced garlic, red onion, capers, chopped celery, olive oil, fresh basil, parsley, and dill. Start by only adding 1 tbsp of the dill to taste test, before adding the other tablespoon. Mix everything together, then add the cooled potatoes, followed by the vegan mayo, mustard, and Dijon mustard (optional). Depending on what you're using to dress the potato salad will determine when you should dress it. A) If you're using vegan mayo (this is the brand I use), then wait to dress the salad until the potatoes have completely cooled. If you don't, the mayo will separate and become very oily. B) On the other hand, if you are using a vinaigrette, you'll want to toss the salad while it's still warm. This will allow all those flavors in the vinaigrette to be absorbed into the potatoes. To finish off the salad, add some salt and pepper to taste, then put in the fridge to chill for 15+ minutes. 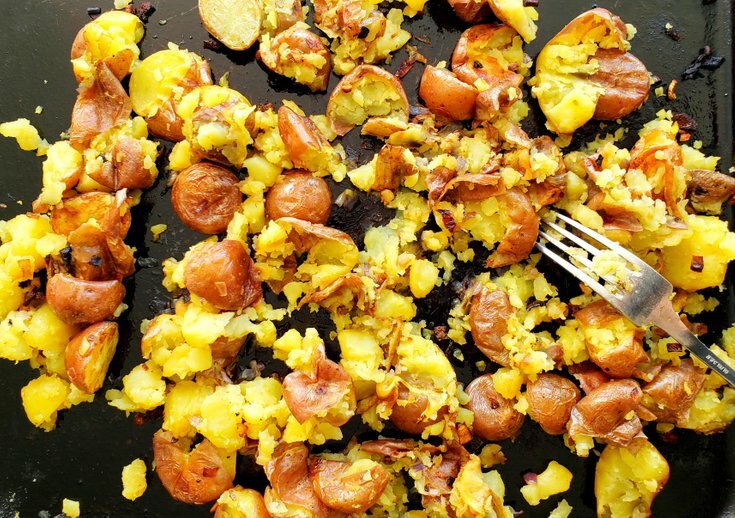 The longer you let your potato salad sit, the more flavourful and delicious it will be! Slice potatoes in half. Then, toss them with olive oil, chopped red onion, and garlic. Dump onto baking sheet, and cook for 20-30 or until a knife can easily be inserted into the side. Once cooked, use a fork to mash some of the potatoes (you want some texture, so don't completely mash every potato). Set aside to cool. In large bowl, add minced garlic, red onion, capers, chopped celery, olive oil, fresh basil, parsley, and dill. Finish the salad off with some salt and pepper to taste, then put in the fridge to chill for 15+ minutes. Start with 1 tbsp of dill, taste, then add more, if desired.